If you are looking for a pigeon that is very attractive, tame, friendly, and easy to breed, the Old German Owl is the pigeon for you! The Old German Owl is a stocky little pigeon that will almost fit in your hand. Seeing that friendly face coupled with a cheerful demeanor and a fairly tame nature, makes them fun to have. They are easy to keep and are also very easy to breed. These pigeons are very good parents and may also make good foster parents. In addition to their friendly disposition, Old German Owls are very energetic. They are terrific flyers and will perform incredible aerial acrobatics, doing lots of dips and twirling in circles. The color of their plumage is very visible and they are delightful to watch in the air. The Old German Owl is definitely a candidate for free flying with a dovecote type housing arrangement. Distribution: The "old" German Owl was definitely known of in the nineteenth century, but around 1870 Oriental Frills and Anatolian Owls were imported into Germany. Crosses with these breeds and other varieties altered the head properties of the German Owl and there became a short-beaked breed. In about 1894 fanciers developed a standard for this new variety and the number of the original "old" German Owls was greatly diminished. It was not until 1956 that there was an active re-establishing of the original breed. Today it is again popular and is shown throughout Germany. The German Owl has been known in the United States for many years and its standard is listed in the National Pigeon Association's Encyclopedia of Pigeon Standards. This has led many American breeders to believe that the German Owl is the older breed and that the Old German Owl is a new breed, when, in fact, the Old German Owl really is older. The Old German Owl is somewhat of a "new" old breed. The German Owl has been is listed in the National Pigeon Association's Encyclopedia of Pigeon Standards for many years but fell out of popularity, becoming very rare in the United States. Today it is again becoming very popular, with the shield-marked variety having been shown for at least the last 40 years. There are basically three varieties of Old German Owl that are developed for showing, the shield-marked, the tail-marked, and the self-colored. Both marked varieties come in a wide array of colors, and self-colored birds come in red or white. There are 19 known color varieties. The most common variety found is the blue bar. In general the Old German Owl is a medium sized bird about the size of a field pigeon, though it is broader in the breast and narrows sharply toward the tail. The wings are tight against the body. The legs are fairly short with the tops being nearly completely covered with body feathers. The neck is also short and thick and the front of the neck and breast have a nice full frill. There can be a tuft of feathers like a dewlap on the throat. The shell crest is one of the most striking attributes of the Old German Owl, supported on the back of the neck by a well developed mane. The beak is a medium length and broader at the base They have big dark eyes, surrounded with fine pale eye ceres. Other pigeons breeds described as being very much like the Old German Owl and that have been popular in northern and eastern Europe for more than a hundred years are the Gent Frill in Belgium, a Dutch bird referred to as the Farmer's Owl, the Norsk Petent in Norway, and the Anotolian In Greece. Care and feeding: The Old German Owl will do best housed in a roomy aviary, and will also be a perfect choice for a free flight bird housed with a dovecote. It's main diet can be a commercial dove and pigeon mix generally consisting of seed, cereal, and legumes. This must be supplemented with greens rich in minerals, vitamins, and calcium. Grit and gravel are also essential. Social Behaviors: Old German Owls have a very friendly demeanor and are fairly tame. They are fun to keep and are peaceable. They form permanent pairs and should be kept together. See About Doves & Pigeons: Social Behaviors for more information on social behaviors of doves and pigeons..
You will enjoy them for their acrobatic antics as well as their attractive markings both in the aviary and when they are in free flight. These birds do best in an aviary or dovecote because they need room to fly. Breeding/Reproduction: This is a very easy pigeon to breed and their beaks are long enough to feed their own young perfectly well. They are very good parents. 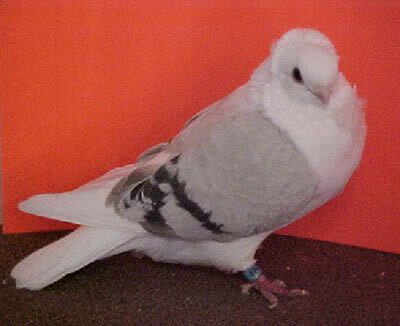 Availability: These pigeons are becoming more popular and can be found through bird shows, bird clubs or breeders. One of my pets died and I wanted another pet. I looked up doves and pigeons on google. It came up with this website so I looked through it and found this beautiful, cute old german owl dove. I was captivated by this bird and immediately I decided on this for my 12 birthday present. These birds look amazing. And Animal-Word I LOVE YOUR WEBSITE!